Thanks to Steve and Judy Jones, whose kind assistance and contribution helped to bring this information to you. Ralph and his wife, Abigail Burchmore had five children. The goblet was inherited by their daughter Sarah Thrale1. Sarah married, carpenter, John Wilshire2. Together they had seven children. Sarah died aged 79 at Cambridge Cottage, Wheathampstead, Hertfordshire, England on 3 December 1884, and the goblet passed to son Thomas George Wilsher a baker from Wheathampstead. Thomas was born 20 March 1840. Thomas' first wife was Eliza Jane Tindall3. Together they had two children. The goblet then passed to their son Thomas George Wilsher Jr, born Wheathampstead 12 May 1864. In 1884, aged 20, Thomas emigrated to Melbourne Australia to escape being made to go to Italy for singing lessons. He had a marvellous voice and sang in the choir at St Alban's Cathedral. Thomas's sweetheart, Mary Brock Billows who was 12 years his senior, followed a few months later in 1885. She emigrated with her brother, Frederick in order to marry Thomas. Subsequently Thomas and Mary had two children. They later moved to Brisbane, Queensland where Thomas was a confectioner and baker, most likely a trade learnt from his father. Mary's father was a gas lighting engineer. He died in 1857 in Calcutta, India from cholera where he was installing gas lighting for the city. 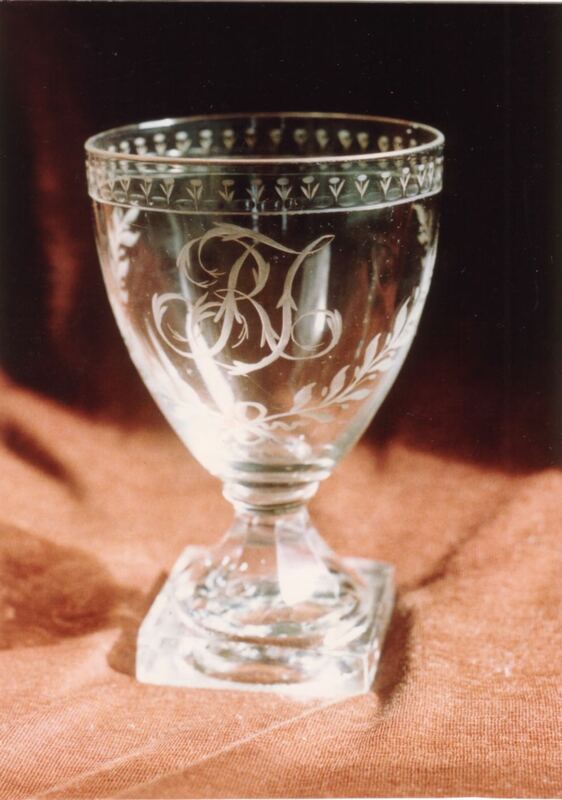 The goblet then passed to their second child, Gladys Charmbury Brock Wilsher, born 1890 in Brisbane. Upon her death at the grand age of 98, the goblet passed to daughter Grace Wilsher, the present owner4. 1. Wheathampstead 11 August 1805 - 8 December 1884. 2. 1805 - 27 December 1876. 3. Born 5 December 1845 in Woolwich and married 18 October 1863 in Islington. 4. David Thrale's fourth cousin, once removed.